Up until now, British roads have been uncomfortable to ride on, not anymore. Introducing the Specialized, Roubaix range designed to battle with the toughest of surfaces whilst providing supreme comfort and stiffness at an optimal weight, whether that's on the way to work or your local Sunday morning group ride. This bikes comfort orientation makes it great for testing British roads in harsh winter conditions thanks to its Hydraulic disc brakes. Built with revolutionary future shock suspension found on the head tube, providing 20mm of travel, this design not only improves comfort but overall smoothness and speed thanks to a Specialized's partnership with McLaren Applied Technologies. Finally, this model of the Roubaix range has been finished with Shimano's 105 groupset that offers improved 11-speed shifting reliability as well as a DT-Swiss wheelset that is great for training or racing purposes! Of course, you're probably thinking, "get on to the suspension thing up front." Specialized call it Future Shock, and essentially, it's a piston in the head tube with 20mm of travel. They developed this technology in partnership with McLaren Applied Technologies, and the result of this is a host of drastic performance improvements, namely in the vertical compliance department. 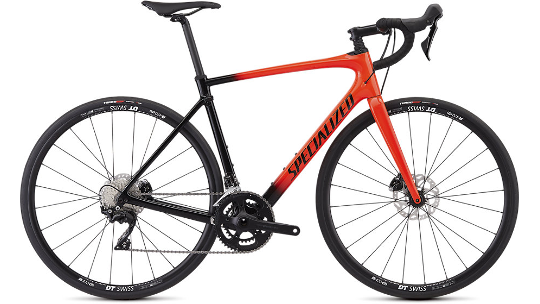 Without giving a physics lecture, Specialized found that focusing on vertical compliance, instead of fork splay, meant that they could improve smoothness, speed, and comfort in one fell swoop. And of all the bikes that Specialized have tested with their Rolling Efficiency Model, the Roubaix outperforms anything on the market. The frame is among the lightest that Specialized have ever made, and it's been constructed from superlative FACT 9r carbon fibre. Its stiffness levels are also off the charts and compared to the SL4 iteration of yesteryear, you'll experience a whole new, faster, and more efficient geometry.